Wasilla, Alaska Real Estate Explore Homes for Sale in Wasilla, AK! 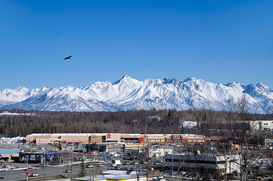 The sixth largest city in Alaska, Wasilla is a bustling town with something of a famed history. Before Sarah Palin was elected Governor of Alaska, she served as mayor of Wasilla. Due to its close proximity to Anchorage, Wasilla is the perfect commuter town for those who want the taste of a bigger city but still want the opportunity to get away from it all. Wasilla has a varied transportation system that includes a system of public-access seaplanes. Neighboring towns and cities include Fishhook, Gateway and Palmer, to name a few. Hockey is a major activity in the Wasilla area. Aside from having a franchise team, the Alaska Avalanche, there are plenty of smaller, intramural teams that play regularly. If you’re not so steady on a pair of skates, you can also partake in everything from fishing and hiking to canoeing and kayaking to past the time. The average home value in Wasilla is $232,300, which is a 2.5% decrease from 2012. Current listings in Wasilla range from below $200K to well over $12.1M. This range includes commercial and large land listings.